Last week, the International Campaign to Ban Landmines published its annual Landmine Monitor report, the 16th annual edition, which details the state of mine action around the world (The Monitor). One of the key findings of the report was the fact that landmine casualties in 2013 had dropped to their lowest ever recorded level: 3,308 persons killed or injured by landmines. This represented a drop of 25% in casualties from 2012 and roughly a third of the number of casualties recorded in 1999 when two people were killed or injured by landmines every hour of every day. That good news should be tempered by the constant reminders against complacency. In 2013, only 185 square kilometers were cleared of landmines (compared to 200 square kilometers in 2012) and the funding available for mine action declined by more than 10% from the record high funding of US $497 million in 2012. In Africa, new use of landmines was reported in Libya and Tunisia; in both countries rebel groups or non-state actors were responsible. Across the continent, 647 persons were killed or injured by landmines in 2013 compared to 676 casualties in 2013, a decline of only 4% compared to the global drop of 25%. 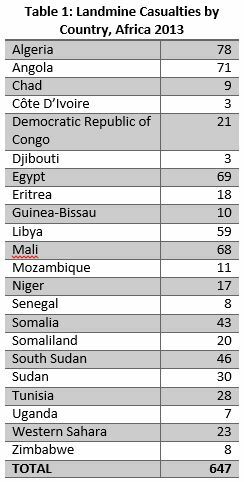 Also, ten countries (Algeria, Angola the Democratic Republic of Congo, Egypt, Guinea-Bissau, Mali, Mozambique, South Sudan, Tunisia and Uganda) all saw their landmine casualties increase from the previous year (The Monitor; The Monitor). Especially tragic is the increase in casualties in Mozambique which is likely to be declared landmine-free in a few months’ time and the alarming rise in Tunisia where the 28 casualties is almost triple the number recorded in the previous two decades and the first confirmed landmine casualties since 2002 (The Monitor). According to the report, “refugees or IDPs [internally displaced persons] that survive explosions, like other persons with disabilities, are among the most vulnerable groups of refugees and IDPs. They are the first who are affected physically, socially, and economically and the last to get assistance.” Also, because of “new use of landmines in Unity State, near South Sudan’s northern border, returnees have faced a myriad of hazards. In 2011, more than 200 people were killed or injured by landmines/ERW in South Sudan, most in Unity State. Many of those people were on their way back from Sudan.” The presence of landmines in the disputed Abyei region has prevented the return of thousands of displaced persons. The report details the difficulty refugee landmine survivors face when trying to access rehabilitation services. Somali, Sudanese and Sahrawi refugees rely on limited service provision in refugee camps in Ethiopia, Kenya and Algeria and face inequalities in access to shelter, education and economic activities and live with the additional threat of sexual violence and abuse. On their return to their home countries, refugees often encounter devastated lands where meeting the basic needs of life are a challenge. The report reminds states of their obligations to protect refugees under the United Nations Refugee Convention to which most countries are a party. The Executive Committee of the UN High Commission on Refugees called on states to “protect and assist refugees [with disabilities] and other persons with disabilities against all forms of discrimination and to provide sustainable and appropriate support in addressing all their needs…” However, the provisions of the Refugee Convention are the minimum standards and in some places, regional conventions and agreements provide for a higher standard of care and response. In regards to Africa, there is the Kampala Convention (the African Union Convention for the Protection and Assistance of Internally Displaced Persons in Africa; The Guardian; Internal Displacement Monitoring Centre), which came into force just six months ago, and is the only treaty that specifically addresses the needs and situation of internally displaced persons (IDPs) who are specifically not covered by the Refugee Convention. In Africa, there are four times as many IDPs as refugees. Among mine-affected countries, States Parties to the Convention include Chad, Guinea-Bissau, Mali, Niger, Uganda and Zambia. Angola, the Democratic Republic of Congo, Eritrea, Ethiopia, Mozambique, the Sahrawi Arab Democratic Republic, Senegal, Somalia and Zimbabwe have signed but not ratified the Kampala Convention which means that they are committed to following the Convention in principle. Kenya and the Sudans have neither signed nor ratified. Article 11 of the Kampala Convention provides for the safe return of IDPs, saying, “States Parties shall seek lasting solutions to the problem of displacement by promoting or creating satisfactory conditions for voluntary return, local integration or relocation on a sustainable basis and in circumstances of safety and dignity.” During a Brookings Institute briefing on the Convention, Chaloka Beyani, one of the drafters of the Convention, confirmed that clearing known minefields would be an obligation of States Parties since the priority of the Convention is the safe return of displaced persons. Alternatively, in places where land is abundant and if displaced persons are in agreement, relocation to known mine-free areas is acceptable which has been the practice in Angola where the low population density has allowed the country to re-settle the displaced. In either case, safe return or relocation, the Kampala Convention requires the States to assure the safety of displaced persons from landmines and other ERW. When I started this blog, I had in mind the fear that new conflicts would lead to new use of landmines. This has been proven true in Libya (The Monitor), Sudan (IRIN News) and Mali (Agence France Presse) in just the last two years. However, the question remains as to whether this new use is part of a trend or just an anomaly? The groups using landmines in Libya, Sudan and Mali were not likely to be dissuaded from their use by international pressure or humanitarian concerns, so further investigation was warranted. Using the available data, I’ve tried to statistically review the situation. When we talk about landmines, one of the biggest points raised is the fact that landmines and other explosive remnants of war (ERW) go on killing many years after a conflict has ended. In Egypt, landmines left over from World War II threaten the lives of Bedouins living in the battlefields of El Alamein (Al Jazeera); in Laos, ordnance dropped by American airplanes almost half a century ago prevent land from being used for agriculture (The New York Times); in Belgium a woman, not even thirty years old, is the youngest survivor of the First World War, having accidently put a bomb on top of a fire during a school camping trip (The Independent). These are very real examples, but the statistics show a definite and laudable trend: fewer and fewer people are injured every year as a result of past conflicts. From 2005 to 2011, the number of persons killed or injured by ERW from conflicts that ended more than two years previously has dropped from almost 2,800 people to less than six hundred (see category “No Conflict” in the chart below). At the same time, the number of people killed or injured in the immediate aftermath of a conflict (“Conflict Ended”) has remained at or below one hundred persons per year (the one exception is Colombia in 2007, when the conflict in the country briefly subsided before resuming in 2009; I treat this circumstance as a statistical outlier). There are three factors playing into this: 1) because of the global stigma against their use, fewer landmines are being used, 2) humanitarian groups are getting better at reaching refugee and displaced populations with mine risk education programs, and 3) demining activities continue around the globe. I don’t dare to say which of these is the biggest contributor to the decline in landmine casualties: depending on the context and country each could be the leading factor. Another, possibly hidden, cause may be that known or suspected minefields are simply abandoned and not subject to re-use after conflicts. On the downside, the number of landmine and ERW victims in countries in conflict has remained constant over the last several years at around 3,000 individuals per year. This number is due to the use of new landmines in countries like Pakistan, Myanmar and Colombia but also due to refugees and displaced persons fleeing conflict and traversing old mine fields in countries like Afghanistan. In these countries, the political solution of conflict termination must precede attempts to clear landmines and reduce casualty rates. However, humanitarian agencies do work in the conflict space to provide mine risk education and create safe spaces for displaced persons to gather which probably reduces the number of victims somewhat. If we look deeper into the numbers, focusing solely on Africa, we see some of the same trends continuing and new ones emerging. In his book, Fate of Africa, Martin Meredith called the first years of the 21st Century, some of the most violent in Africa’s post-independence history. The data from the Uppsala Conflict Data Program supports his assertion with 14 separate conflicts across the continent in 2000 and 2001 and 12 in 2002. However, the total number of conflict declined to a low of just five in 2005, before climbing back up to 12 in 2011. 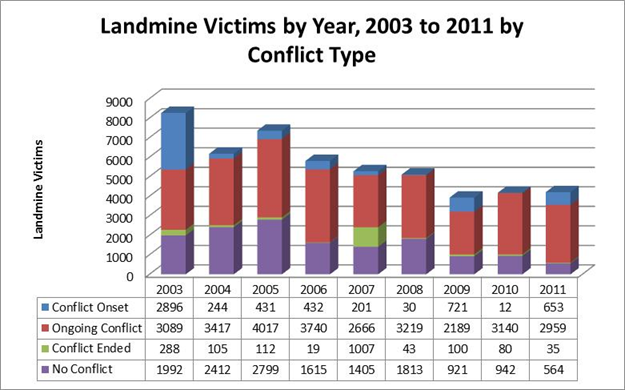 Beginning in 2005, the number of landmine victims in conflict-free countries fell, similar to how the number of victims in all conflict-free countries fell as we saw above. In addition, the number of landmine victims per conflict declined in the same period, from almost 120 victims per conflict to about 35 victims per conflict. Except in 2011. In 2011 with the Arab Spring revolts against Libya, the renewed conflict between Sudan and South Sudan and the invasion of Somalia by Kenya to wipe out Al Shabaab, three violent (Uppsala calls them Level 2 Intensity) conflicts broke out. In these conflicts, an average of more than 150 persons were killed or injured by landmines as the total number of Africans killed or injured by landmines increased by 50% over the numbers seen in 2009 and 2010. As I stated above, these conflicts may be unusual, but unfortunately they reverse the gains made to date. In 2000, there were six Level 2 intensity conflicts and 840 people were killed or injured by landmines in those conflicts. In 2005, there were no Level 2 intensity conflicts and a clear trend had begun where fewer and fewer landmines claimed victims in Level 1 Intensity conflicts. As the Level 2 conflicts broke out, we see a slight uptick in the number of victims per Level 1 conflict. Fortunately the number of victims in conflict-free countries continues its downward trend, a trend that, like those above, suggests when conflicts end, the number of landmine victims will gradually decrease. Data for this post came from the Landmine Monitor (www.the-monitor.org) and from the Uppsala Conflict Data Program (http://www.pcr.uu.se/research/UCDP/). 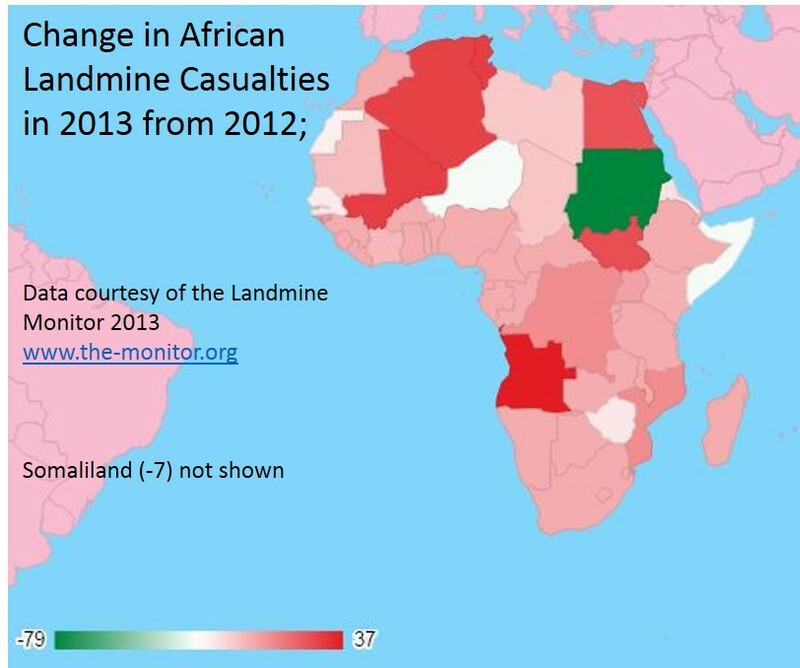 The Narrative from the 2012 Landmine Monitor; Improving or Not? 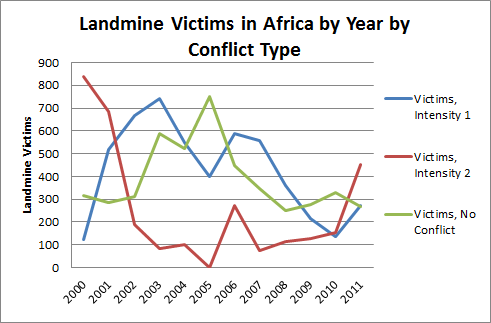 The general narrative of the 2012 Landmine Monitor is one of positive improvement. From a release, “Amid the odd relapse, progress towards a world free of antipersonnel mines is inching forward” and “Some long term hold-outs [to the Treaty] have joined, namely Finland, and hopefully Poland will, too, by the end of this year. It is clear that the stigma against the use [of mines] is as strong as ever,” and “The mine action budget in 2011 was about US$662 million, the largest annual total to date” (All Africa). However, in 2o11, according to the Monitor, recorded landmine victims have actually increased for the second year in the row. The Monitor explains this with the phrase “the 2011 figure is similar to… 2009 and 2010” but doens’t actually say that it is an increase. Now, there are two possible explanations: either the number of casualties has become static and the progress of the past 15 years has stalled, or the recent documented use of landmine has led to a regression and the number of casualties is slowly increasing. First, let’s look at the possibility that the number of casualties has stabilized and the documented increases represent deviations around a new norm. The Mine Ban Treaty’s success over its first dozen years is nothing short of incredible. The fact that an accepted weapon has been given by nearly every army in the world is astounding, but if progress has stalled, surely that is an important story. The remaining holdouts to the Mine Ban Treaty, including the United States, Pakistan and China, and the countries who have not met their demining obligations within the original ten-year period are responsible for new landmine casualties. As states continue to delay on their mine clearance responsibilities and States not Party remain outside of the Treaty regime, further positive progress for the Mine Ban Treaty is not possible and so the story needs to be that the incredible progress of the Mine Ban Treaty has stalled and action by states, like the United States, is required to restart the positive momentum. Alternatively, the fact that the number of landmine victims has increased for two years running, along with documented new use by states like Israel, Libya and Syria (and suspected use by Sudan and Yemen), actually shows that the Mine Ban Treaty regime is weakening and we can continue to see the number of victims increase. Let me offer the following in support of this: In 2009 there were 635 landmine casualties on the African continent and in 2010 there were 624, but in 2011, there were 1,009. That’s a 60% increase and can’t be explained as in line with the previous years. The new and renewed conflicts in Libya, Sudan and Somalia were responsible for most of that increase, but countries that have long been at peace like Angola, Senegal and Uganda also reported significant increases in the number of victims in 2011. The new victims in these countries are the result of failures of those states to clear their mines (especially Uganda and Senegal). Whichever is true, the number of landmine victims is increasing or the number of victims has been stable for the last three years, neither is particularly positive. Either the great progress of the Mine Ban Treaty has stalled or worse, it has regressed. I hope it is the former and fear it is the latter. The Landmine Monitor, published annually by the International Campaign to Ban Landmines, is the verification mechanism for the Anti-Personnel Mine Ban Treaty. This year’s Monitor was published this week in advance of the Twelfth Meeting of States Parties to the Mine Ban Treaty and has several items of interest related to landmines in Africa. The good news reiterated the fact all of Sub-Saharan Africa is now under the Mine Ban Treaty regime after the accession to the Treaty by Somalia and South Sudan. The bad news is that the number of people killed or injured by landmines increased in Libya, Sudan and South Sudan in 2011. There’s more of each in this year’s Monitor. All quotes and references are to the 2012 Landmine Monitor, available here. “In 2011, there were reports of new mine-laying in South Kordofan state in the Nuba Mountains inear the border with South Sudan as part of clashes between the Sudan Armed Forces (SAF) and the northern branch of the Sudan People’s Liberation Movement / Army…(SPLM-N). [United Nations] reports claimed that both the SAF and the SPLM-N laid antipersonnel mines in strategic areas of… the capital of South Kordofan state. “[A] British journalist… photographed three crates containing a total of at least 100… Iranian-made copies of the Israeli Mark 4 antipersonnel mine… Locals warned the journalist about entering the hill surrounding [where the crates were found], saying the area had been mined by Sudan government forces. The government of Sudan denied the accusation, blaming the SPLM-N rebels for using the allegations of mine use as a means of gaining leverage against the government. There was no indication of whether or not the accusation of use by the SPLM-N was reviewed or refuted. In 2011, Nigeria declared that it had cleared all known anti-personnel landmines. This is balanced by the news that Niger and Burundi, states that were reported to be cleared of anti-personnel mines, had discovered areas contaminated with mines. In Niger, the mines are remnants from French colonial forces; in Burundi, suspected areas were reported despite previous declarations that Burundi had cleared all landmines. In total, 17 countries in Africa have mine clearance obligations that need to be met. The Monitor reports that the extent of contamination in the Republic of Congo is unclear, however, a recent report from Norwegian People’s Aid declared the Republic of Congo free of landmines. Uganda was due to complete its mine clearance activities in August 2012 and as of publication of the Monitor, Uganda still had work to be done. Chad and Zimbabwe have requested initial extensions to their 10-year mine clearance obligations, extensions during which the national mine action authorities were supposed to complete surveys to determine the extent of landmine contamination and develop plans for comprehensive clearance. Neither country appears to have completed the surveys and so they are likely to require additional time beyond their estimates to complete any demining. The Democratic Republic of Congo and Mozambique have discovered additional suspected areas of landmine contamination, but continue to make progress towards becoming mine-free according to their extension requests. Ethiopia, seemingly alone among mine-affected countries, believes it will be able to complete demining two years ahead of schedule, provided financial resources are available. For the second year in a row, the number of reported landmine victims increased. In 2009, a reported 3,956 people were killed or injured by landmined; in 2010, 4,191; in 2011, 4,286. The Monitor treats the increase as a consistent pattern (basically, just a minor annual fluctuation), and may simply reflect better reporting. I hope this is so. Of the ten countries with the largest number of victims in 2011, 4 were in Africa and alone had 658 casualties, 15% of all casualties globally: South Sudan, Libya, Somalia and Sudan. In 2010, Libya reported only one landmine casualty; in 2011, Libya reported 184. In 2010, the Sudans had 149 casualties; in 2011 there were 328 casualties. These increases reflect the new reported use of mines in these countries and the continuing conflict and refugee flows. As in previous years, children make up a large proportion, 42%, of the new casualties. In Libya, children represented 62% of the casualties and in Sudan they represented 48%. Planning for victim assistance in Burundi, Chad, the Democratic Republic of Congo, Ethiopia, South Sudan and Sudan took large strides forward as they developed and implemented national victim assistance plans in compliance with the Cartegena Action Plan. Globally, in addition to the increased number of victims in 2011, the amount of international funding dedicated to victim assistance declined by almost 30% from 2010 and is the lowest amount since records have been kept. Angola and Uganda have both closed facilities that provided services to landmine victims; support for these facilities was supposed to come from national sources, but that has not happened. This despite the fact that Angola provides more money to its own mine action program than any other country does. Angola has prioritized mine clearance over victim assistance.